The policy has delivered at least 78,000 extra H-4 work-permits to the spouses of foreign H-1B guest workers. Many of the spouses are white-collar graduates who compete for the jobs also sought by young American graduates. A regulation to end the H-4 giveaway is “on the table” an agency official told Breitbart News. If published in the federal register, it will be enforced after 60 days but likely will be tangled up in business-funded lawsuits. But the move — if implemented amid business hostility — would impact less than 10 percent of the roughly 1 million resident white-collar guest-workers. The giveaway was begun in January 2015 by officials working for former President Barack Obama, after public opposition blocked Obama’s business-boosting “Gang of Eight” amnesty-and-cheap-labor bill. Immigration lawyers and business groups are already denouncing the proposed loss of imported white-collar workers, and are promising to block the pro-American regulation with lawsuits. Todd Schulte runs the FWD.US lobby group for Silicon Valley investors. His chief priority is raising the annual inflow of cheap white-collar guest-workers, so he opposes any actions which would reduce the extra supply of foreign workers for companies including Facebook, Twitter, Microsoft, and Amazon. The H-1B spouses are going to get green cards anyway, so there is no need for concern, says New York immigration lawyer Cyrus Mehta, who earns a living by importing foreign workers who lower wages awarded to Americans. Bet their rationale will be "Protect American workers and American jobs". But like you said, H4 EAD goes to limited people already in line for GC or "Americans in waiting". Very cruel and pure xenophobia. Any withdrawal of work-permits from H-1B spouse is racist, says Amy Siskind, a progressive activist. The draft regulation was prepared by agency officials who are looking for ways to curb the huge H-1B program, which keeps roughly 550,000 foreign professionals in U.S.-based jobs. Most of the H-1B graduates work as lower-tier computer and software experts, but the program has also allowed Americans companies to hire hundreds of thousands of foreign non-tech workers, including foreign pharmacists, therapists, industrial designers, lawyers, editors, teachers, doctors, professors and lab technicians. In his inauguration speech, President Donald Trump promised a policy of “Buy American, Hire American.” But business lobbyists have strongly opposed any rollback of the guest-worker programs, and agency officials have not cut the size of the programs. Instead, they have added more paperwork and costs to the industry requests for H-1B and L-1 visas while administration officials argue over whether the H-1B, H-4 and OPT guest-worker programs should be reduced. Media reports about the H-1 program are usually inaccurate. Most reports echo industry claims that the program is capped at 85,000 new foreign workers per year. But each worker can stay for six years, and non-profits — such as universities and their business partners — are exempt from the cap and now employ roughly 100,000 H-1Bs in prestigious jobs. Federal officials have never provided a precise count of the number of resident H-1B, but estimates range from 450,000 to 950,000. The higher estimate includes people who arrived as H-1Bs but are now waiting for a green card. Several women interviewed for this article said they dreaded the thought of going back to forced unemployment. Some said living on one income in the exorbitantly expensive Bay Area would lead to financial struggles for their families. Before the work authorization, some women had gone back to school, volunteered or raised children, but others said they spent time mourning the life they once had, when they weren’t reliant on their husbands for money. At 21, when you start to build your career, #H4Dreamers will be thinking of #deportation. How is this fair @SenateGOP @SenateDems @HouseGOP @HouseDemocrats ? The H-1Bs are only part of a huge foreign workforce of roughly 1 million people with work-permits under the L visa, the OPT work permit, the TN free-trade document or the J-1 visa. That huge population is larger than the number of young Americans who graduate from college each year with degrees in business, accounting, science, software, statistics, architecture, biology, medicine, and engineering. Business leaders strongly support the visa programs, partly because any reduced inflow of foreign workers will create a tight labor market for American white-collar workers. A tight labor market will force up salaries — and so reduce profits, stock market values, investor payouts, and even CEO bonuses. Foreign workers are willing to accept lower salaries partly because almost any job gives them a chance of winning a deferred green-card bonus from the federal government. That bonus is extremely valuable because each green card provides a path to citizenship for themselves, their parents, all their descendants, plus many chain-migration relatives and their children. In effect, the H-1B program allows CEOs to hire cheap foreigners by paying them with taxpayer-funded green cards. 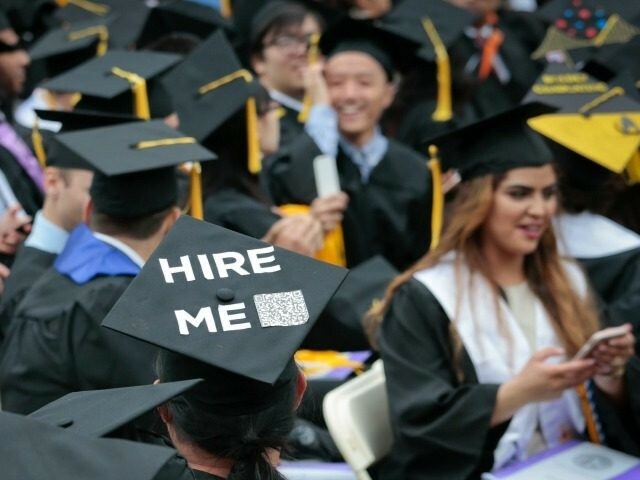 The cross-tabs show that 36 percent of Americans strongly supported the proposal to raise pay for H-1Bs to encourage more hiring Americans, while only 8 percent strongly opposed the proposal. Each year, four million Americans turn 18 each year and begin looking for good jobs in the free market. To read more about H-1Bs, click here.